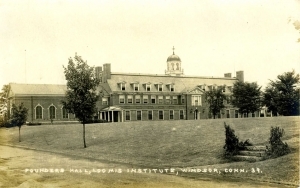 Description: Sepia toned photo postcard of the newly-constructed Founders Hall on the campus of the Loomis Institute in Windsor, CT. The school opened in 1914 and today is known as the Loomis Chaffee School. Founders Hall anchors the campus quadrangle.